Is it going to be raining and where will we eat? With these two questions answered it undoubtedly makes for a smoother day out, or it does where my kids are concerned. With one fussy eater I always feel a bit more relaxed when I know that there will be somewhere that he will eat. Definitely check the weather before you head to Kew Gardens, something I always forget to do and we are the one family walking around in jumpers getting soaked. As a venue that is predominantly outside, if it is going to rain then you’ll want to make sure you have rain coats and umbrellas, you probably won’t need a picnic blanket either! However picnics are allowed on all the grassy areas in Kew. If you decide to take a picnic to eat as you wander around, then you could head to one of the many cafes or restaurants for a hot drink instead. Alternatively, if you do decide to eat at one of Kew’s five cafes or restaurants, there is a kid-friendly menu at White Peaks café, and The Orangery and Pavilion serve children’s portions and boxes. For more information on the cafes are restaurants click here. Bicycles, tricycles, roller skates, skateboards, micro-scooters, balance bikes and other vehicles (except powered wheelchairs) must be left at the gates so it’s a good idea to take lock to secure it. These can vary depending on the time of year so be sure to check ahead, see below for more information. Where are the kids areas? The Log Trail was created from trees brought down by the 1987 storm and is a perfect place for kids to hop, skip and jump around. Follow the trail through some of Britain’s best loved native trees and plants. Spot ladybirds, centipedes, beetles and spiders living in our bug hotels. Explore the underground world of badgers in a life-sized Badger sett. Enter into a warren of tunnels that connect food stores, sleeping chambers and nests. 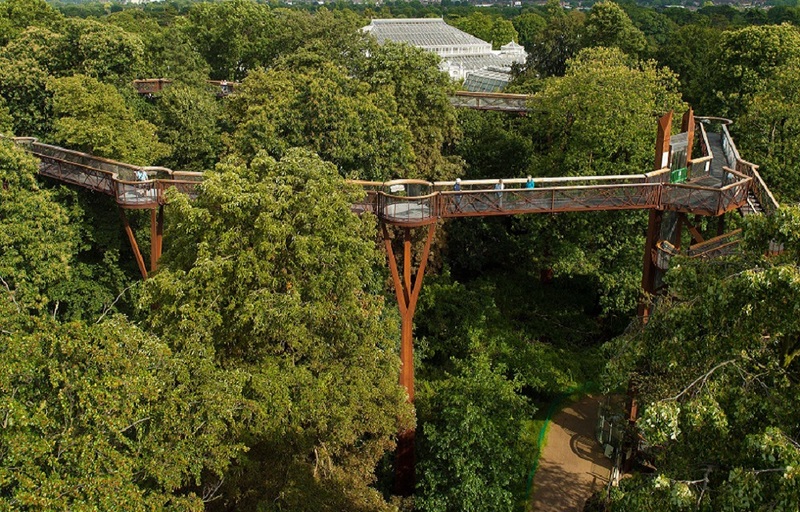 The Treetop walkway is 200 metres long and is 18 metres above ground. Walking along it gives you a unique view of the forest canopy and the world within it. The Walkways structure was inspired by the Fibonacci numerical sequence, frequently found in nature’s growth patterns and the engineers that built it say it should last 500 years. We decided to lay on our tummies and look down! That made for an interesting view! There is also a path leading below ground to Rhizotron, an underground lab which has been constructed to study the soil. It is designed to flex slightly in the wind so don’t worry if you feel it swinging and moving a bit! The Temperate House has recently re-opened after a 5 year restoration project. This summer, meet a friendly giant called Gnomus who can show you around sharing stories about some of the world’s rarest and most endangered plant species. Plus on weekends until 2nd September, from 12:30-4pm, see a beautiful musical aerial act – Harmonic by Cirque Bijou – suspended from the rafters of the Temperate House. The Palm House is an iconic Victorian house with a tropical climate, a perfect hideout if it’s cold outside. Many of the plants found in The Palm House are important in modern life and it’s worth seeing if the kids can spot them, look out for the Rubber tree (Hevea brasiliensis), African oil palm (Elaeis guineensis), Coffee (Coffea), Pepper (Piper nigrum), and Sugar cane (Saccharum officinarum) and a Cocoa tree (Theobroma cacao). The Princess of Wales glass house is the most complex as it contains ten computer-controlled climatic zones under one roof. The Water-lily house is a small, square glasshouse, it has a tropical habitat displaying many colourful waterlilies, ferns, papyrus and hanging gourds. It encloses a circular pond spanning over 10 metres, the staff at Kew use fish and dye the water black with food dye to stop algae growth which makes pretty reflections the kids will love. 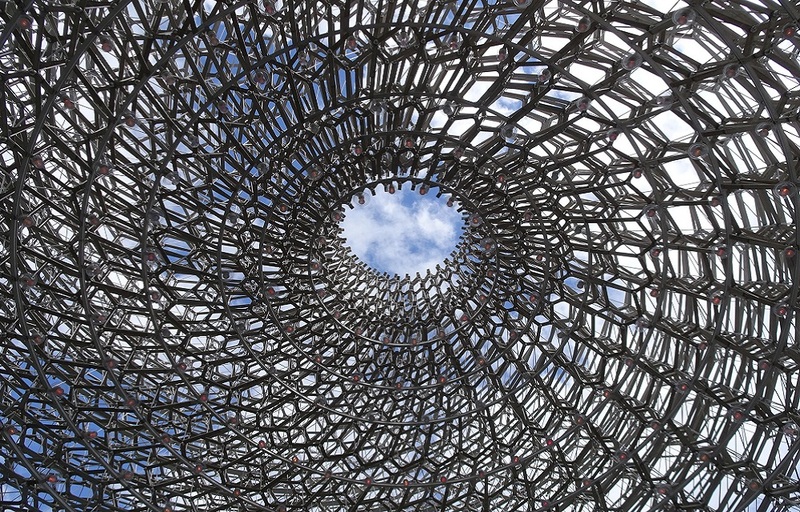 The Hive is a multi-sensory experience to highlight the extraordinary life of bees. It stands at 17 metres tall and is set in a wildflower meadow. What is absolutely amazing about this experience is that the multi-sensory aspect inside the Hive structure itself is triggered by actual bee activity in a real beehive at Kew! There is an accelerometer that sits in one of Kew’s beehives which then transmits the vibrations of the bees activity across to the The Hive in real-time. Also, the structure is lit up by 1000 LED bulbs which turn on and off according to these vibrational signals from the beehive, creating a visual representation of the activity in a beehive. Plus, step underneath The Hive to the white columns to discover how bees communicate. You will find lollipop-type sticks that you can place in the different sections of the column bone-conductor. You then hold on to the other end of the stick with your teeth and put your fingers in your ears and you should be able to ‘hear’ the bees. If the the kids legs get a bit tired, why not hop aboard the Kew Explorer Land Train which departs every hour from the main departure stop at Victoria Plaza between 11am-3pm (£5 Adults, £2 Children. Essential carers go free) It’s a great way to learn about Kew with a full commentary from the driver. The tickets are valid all day and you can re-join the train at any of the stops. The whole round trip takes approximately 40 minutes and you can find the full timetable at each stop. You can buy tickets online ahead of your visit or from the driver, at the gates and shops plus here is a map of the explorer route. Did you know Kew has one of the smallest Police Forces in the world? Called the Kew Constabulary, it has seventeen members, it’s own vehicle and was started in the 1840s, it was originally made up of war veterans and part-time gardeners. In Kew’s famous Palm House you can find the world’s oldest pot plant the huge Jurassic cyad, Encephalartos altensteinii (i), which was collected by Kew’s first plant hunter Francis Masson, from the Eastern Cape region of South Africa in the early 1770s. Built in 1844, no one had ever built a glasshouse of this size before, so the architects borrowed techniques from the ship building industry which may go someway to explain why the Palm House looks like the upturned hull of a ship. It contains seeds of basic food crops and endangered species. It will be opened in 2085, when many of the plants it contains may be rare or extinct. This is not open to the public but can be viewed from a special platform erected in wood which was seized by customs officers in HMRC. There are toilets and baby changing within easy reach of all the main attractions, cafés and gates. Plus the gardens are mostly level and there’s level or ramped access to most of the buildings. There is also a buggy park at The Hive. The restaurants and cafes either have kids menus or do kid sized portions or boxes, see above for more info. There are also microwaves to warm baby bottles in at The Orangery and The Pavilion. Buggy Route – here you can download a map which shows buggy friendly routes. Also remember, the kids are allowed to collect anything that has fallen on the ground, just don’t pick anything that is alive or growing. LittleBird are a proud partner of Kew Gardens and this means that you can quite often save on tickets for your family. This summer, two kids go free with Adult Tickets! See here for more info. 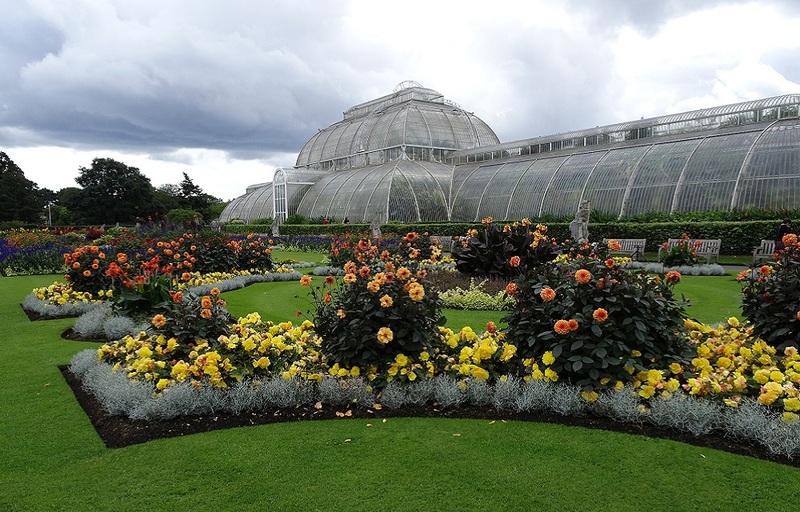 Royal Botanic Gardens, Kew, Richmond, Surrey, TW9 3AE, UK. There are many ways to get to Kew, however parking is limited so it may be best to take public transport if possible. If you are using ab online maps it’s best to search using the postcode of your chosen entrance gate. You can download a free map here or collect one at the gate. Kew Gardens station, which sits between Richmond and Gunnersbury on the District and Overground lines, is the only stop on the London Underground network with a pub attached sits 500m from Victoria Gate. There is no level access from the westbound platform. It is possible to continue one stop to Richmond and catch a tube back to use the eastbound platform which does have level access. Kew Bridge station is 800m from Elizabeth Gate, via Kew Bridge. South West Trains run services from Waterloo, via Vauxhall and Clapham Junction. There is no level access at Kew Bridge. For level access use Richmond station, where there is a lift and level access. Take 65 bus (in the direction of Ealing Broadway) to Lion or Victoria Gate. Route 65 stops close to Lion Gate and Victoria Gate. Route 391 stops near Kew Gardens station. Routes 237 and 267 stop at Kew Bridge station. Kew Gardens does have a car park on Ferry Lane near Brentford Gate (TW9 3AF) but this is limited in space and costs £7 per day. The car park closes 30 mins after the gardens close so don’t get caught out. If you want to park in the surrounding streets this is also limited as it is mainly residential streets. It opens at 10am every day and closes at 4.15pm last entry at 3:45pm (dependent on time of year i.e. later in the summer) Queues can be long in the holidays and on the weekends. Find out more info here on closing times. It is cheaper to book tickets online.. Time and prices vary according to the time of year, so find the most up to date prices here. You can buy same day tickets on the Kew website. LittleBird and Kew Gardens are long-standing partners and we often have great savings for family ticket options, so keep an eye out on LittleBird for the latest offer. There is Free Disabled Parking for Blue-badge holders at Kew’s car park on Ferry Lane (TW9 3AF). Essential carers enter for free and for yourself, you’d just need to purchase a Concession ticket.